A freight train barrels down the tracks and artist Jenine Marsh sits and waits. She waits first for the deep vibrations. Then she waits for the sounds that come all at once—of crashing cars and wheels—and for the rush of heat and air the train unleashes. Marsh is waiting, usually in a rail yard near her Toronto studio, for another sound, an extra noise, she calls it, of metal on metal, as the wheels roll mercilessly over the line of coins she’s placed along the tracks. Pennies, dimes, loonies and toonies scatter into the surrounding dirt and detritus, and Marsh goes in search of the flattened coins, now deformed, defaced and smooth. Train-pressed coins have been a hobby for Marsh since childhood and a recurring element of her work since 2015. They are present—or strongly evoked—in every aspect of her solo exhibition at Oakland’s Interface Gallery, a room at the center of the world surrounded by the noise of men, on view through Saturday, Dec. 2. 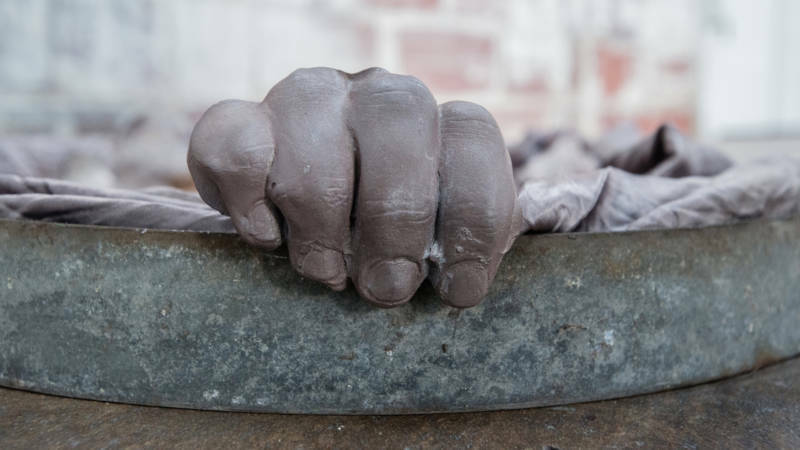 The seven works in the installation operate on shifting registers of heft and human hand but share materials and metaphors—coins, fingers and fists, cement, solder, soil—revealing Marsh’s deeper questions about exchange and value. These questions exist within a system defined by constraints and that, like fiat currency, is predetermined, empty—a system with seemingly little hope for intervention. Interface is small and Marsh’s work fills the space in two ways. Some pieces assert their place (bold, inscrutable sculptures on the floor of the gallery, to be carefully walked around) while others insinuate (thin and small objects made of wire, faint but thoroughly dispersed across the back wall and a nearby skylight). 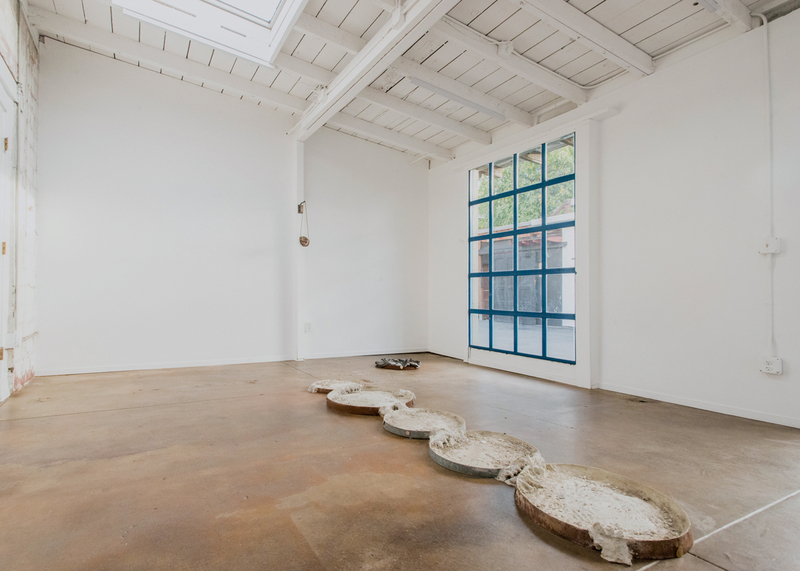 A work titled the trespass is the former: five, 18-inch, found metal hoops lay flat in a line, filled with cement mixed with soil and wildflower seeds (a doctored guerrilla-gardening seed bomb recipe), and scattered with train-pressed coins, more soil and gravely bits. Each hoop is linked to the next by more cement spilling over the rims; the cement is furrowed, ridged and pitted, like the imprints of hands or paws or claws on an industrial wasteland. More hands emerge elsewhere. 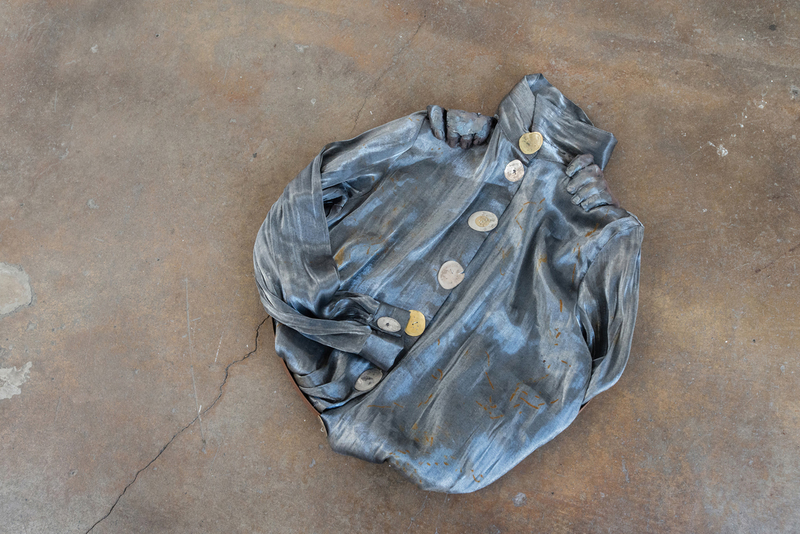 In contortion (steel) and contortion (silver), a few curled fingers and some knuckles—the artist’s, cast in cement—grip the edges of similar metal hoops and rust-stained silk shirts. A single, fully-formed fist is suspended in the middle of one wall, its clenched fingers face the center of the room (titled fist in pocket). Fabric and bungee cords cupped around the heel of the hand make a little pouch, a DIY coin purse. The most compelling image Marsh creates, however, doesn’t hang in the gallery; it’s the slightness of space she conjures, the slimmest, nearly nonexistent gap in which to insert oneself, to slip material into and test the limits of legibility or reform the edges of value. It is the space between the train wheels and tracks where the coins are flattened; it is the crevices between mortar and brick in which those coins are then slotted (coins and tokens). 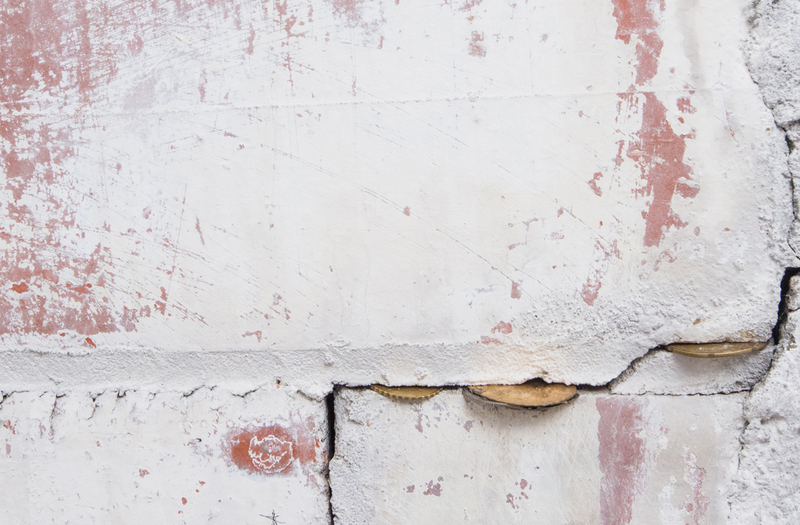 It is the cracks between fingers, through which wet cement squeezes, leaving traces of body and touch. Marsh’s uncanny, elegiac floor sculptures are hopefully liminal; it’s not a missing person signaled in the bounds of contortion but one yet to arrive. Such a view is not a matter of perspective but of potential, and the power of claiming space. 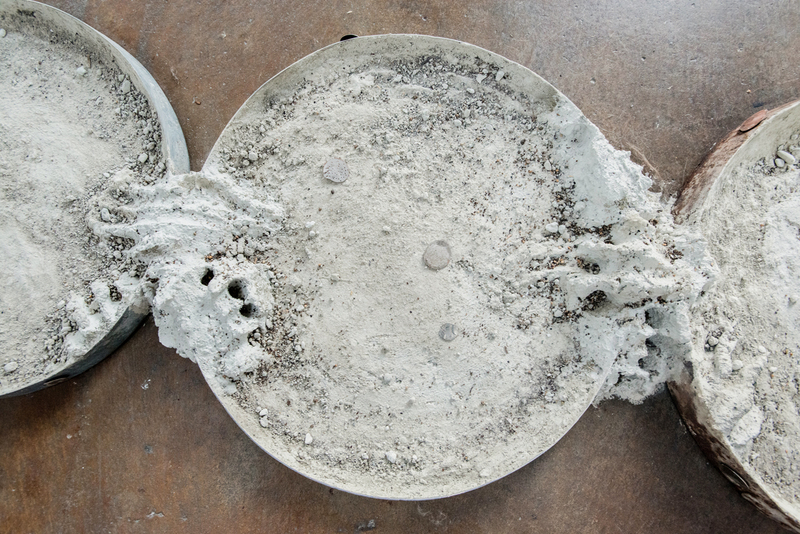 Spare change becomes raw material and concrete fecund. The crushing forces that be—of capitalism, of patriarchy, or any otherwise headlong, hurtling object—are met by the artist’s patience and a small bump, an extra noise. 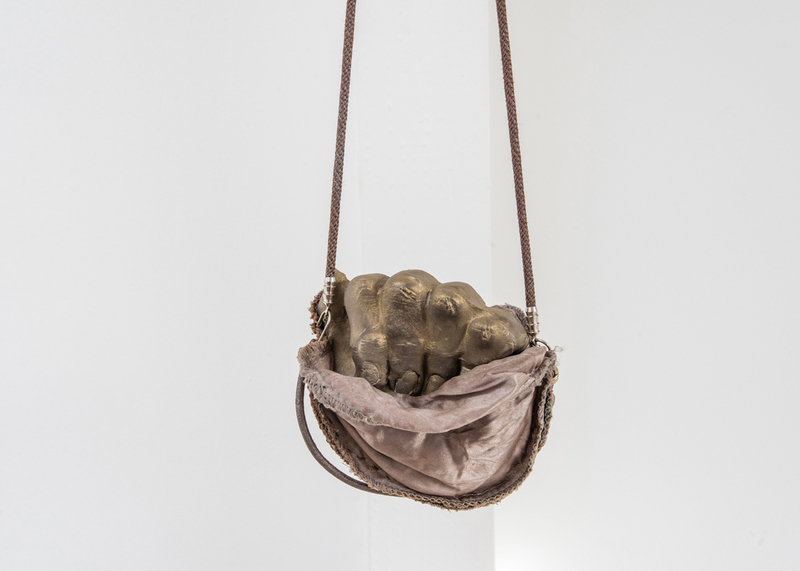 The show’s title is a line from author and critic Claudia La Rocco’s two-page collection, a text written for the exhibition, informed by though not about Marsh’s work. [La Rocco was one of my professors at the School of Visual Arts in 2015.] It marks the start of a new series at Interface wherein exhibitions are paired with newly commissioned work from Bay Area writers, presented together but viewed as independent and meant to complement one another. La Rocco’s text is a collection of 46 sentences and sentence fragments—some new, some lifted from her previous writing—each printed individually on strips of paper and presented in an envelope. It’s a poem and a collage to be ordered by the reader, shaped, paced and read differently each time. Persistent elements of the text are awe at a watery world and the omnipresence of geology; voyage and metamorphosis; the sensation of touch; and an oscillation between the ominous and the expansive. The changing resonances and constant unfolding make it feel like reading a fortune. Both artists reshape found materials, wrestle with inherited structures of power and expression and consider what might be important about an imprint left on a surface. At Interface, both Marsh and La Rocco convey how value might be embodied and how it is ultimately ecological. What kind of marks are left on the landscape and on one another, by words, by fingers, by machines, by shifting rocks, by plants, by train tracks, by industry, by barriers, by boundaries? This is the rate of exchange still left to rectify. 'a room at the center of the world surrounded by the noise of men' is on view at Interface Gallery through Dec. 2, 2018. Details here.